The ceremony was arranged for 3 pm at the memorial. 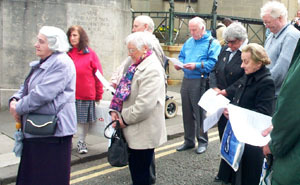 The Right Worshipful The Mayor of Bath, Councillor Ms. Loraine Morgan-Brinkhurst, had agreed to conduct the unveiling. 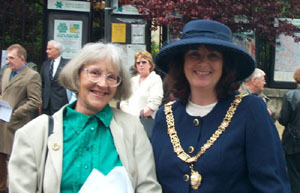 She was welcomed by Mrs Joy Stockley, the Project Committee member who had made the arrangements with the mayor's office. Welcome and Introduction, by Brian Vowles. Brian, a founder member of the Project and member of the Committee, described how the Project started, and its progress towards the unveiling and dedication of the memorial. 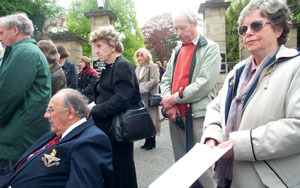 He paid tribute to Francis Joy, who first expressed the need for a memorial to commemorate the people who died in the Bath Blitz by name, and whose vision and energy collected a group of like minded people into a Project that set out to do something about it. Recalling the Blitz, by Harry Hemming. Harry, a survivor of the Bath blitz and an active supporter of the Project, gave a first hand account of how he became a messenger for the Civil Defence services, and his memories of the blitz. 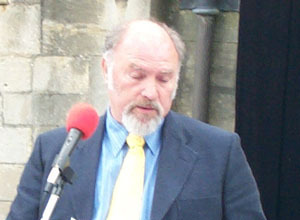 He concluded by saying how important the monument is to the friends and families of those who died. 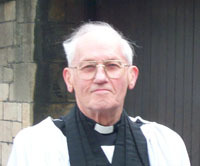 Readings, by The Rev. Henry Andrew Uthwatt. A passage written by the parents of Jane who died from cancer at the age of 25. This dealt with how friends and family remember the life of one who has died. Some verses from Ecclesiasticus Chapter 44. This dealt with the preservation of memories for those who follow after. 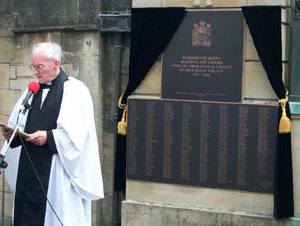 Unveiling the Memorial, by The Mayor of Bath. 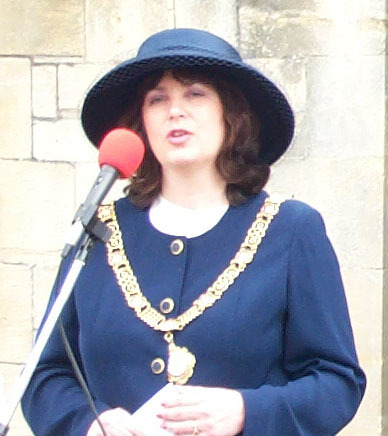 The Mayor of Bath, Loraine Morgan Brinkhurst, said how pleased she was to be given the opportunity to unveil the memorial. Although born after the war, she was Bath born and bred, and she remembered the many tales that her parents had told of their memories of the war and the Bath blitz. She recognised the value of such memories, and the importance of preserving them by passing them on down the generations as she was doing with her children. She saw the memorial, set in a public place, as part of that process - a physical thing that would encourage children to ask questions of their parents and thus they would learn. 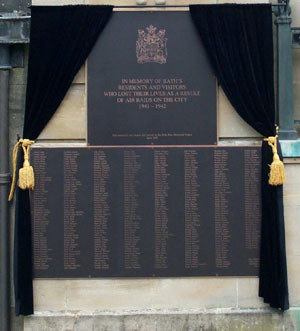 The Unveiling of the Memorial, by The Mayor of Bath. 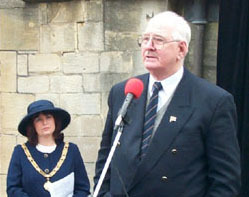 The Dedication of the Memorial, by the Minister. "Heavenly Father we remember the four hundred whose names are listed here, and the others whom we do not know but who also died as a result of the Blitz. As we remember them, we dedicate this Memorial to them, IN THE NAME OF THE FATHER, AND THE SON AND THE HOLY SPIRIT." "In a moment of quiet, let us remember them. If you knew any of those who died in the Blitz of this City, have the person or people in mind especially at this time. If you did not know any of them, then hold in mind the price that many bore during the attack on the City." "They shall not grow old as we that are left grow old. Age shall not weary them nor the years condemn. At the going down of the sun and in the morning we will remember them." "The price paid was not only by those who lost their lives, but also by those who were injured, and those who lost loved ones and by those whose homes were devastated." "Heavenly Father, we commend to your love and care those who suffer in body, mind or spirit. In your goodness and mercy grant them health of body, soundness of mind and peace of heart. We ask this through Jesus Christ . Amen"
For the sake of the Prince of Peace, Jesus Christ, Amen"
"God grant to the living peace, to the departed rest, to us and all his servants, everlasting life. And the blessing of God Almighty, the Father, the Son and the Holy Spirit be with you and abide with you always. Amen"
Click here to display details of the 2004 ceremony.